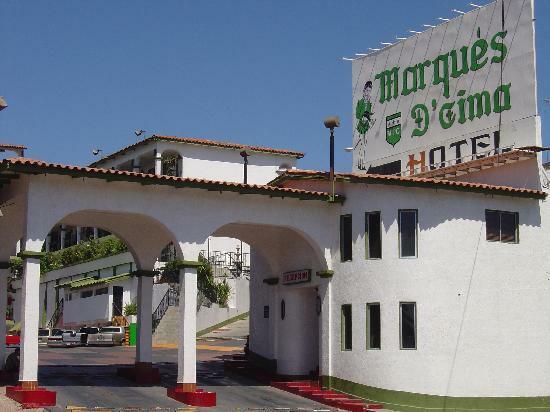 Hotel Marque's De Cima is the premier hotel in Nogales, Sonora, Mexico, ranked the best hotel in Nogales by TripAdvisor (a top internet hotel evaluator.) 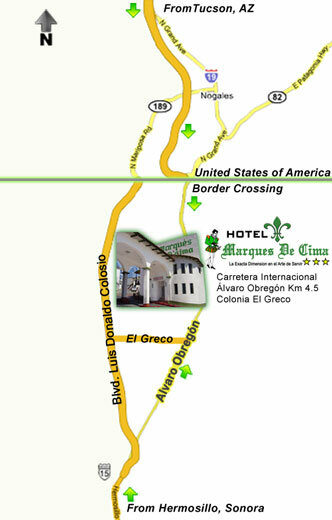 The hotel is located about 4 miles south of the Nogales, AZ city border crossing Click to see directions from all destinations. The hotel provides 24/7 security cameras, 24/7 security guard at the entrance gate and a fully, brilliantly lit parking lot. The hotel also boasts a new electronic door locking system. 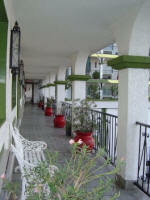 The hotel is safe and secure to help insure your restful stay. 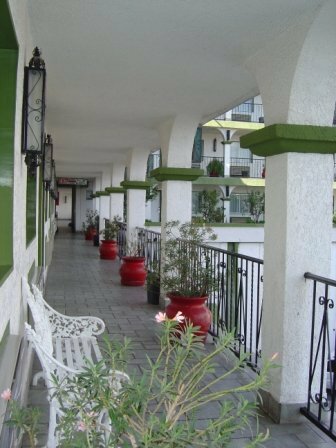 The beautiful verandas with seating to enjoy the evenings and the scenic, panoramic views from this beautiful hilltop hotel. 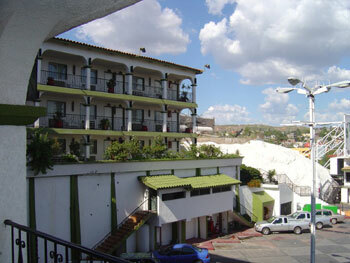 Hotel Marque's De Cima is located in a very safe area at the center of business activities, small shops, manufacturers, the Nogales Mall, restaurants, hundreds of medical and dental professionals and the U.S. Consulate. All the rooms, obviously being rated the top hotel, meet the USA/Canada standards with large 30" TV with bilingual programming, free wireless high speed internet, 1 or 2 beds, telephone and etc. 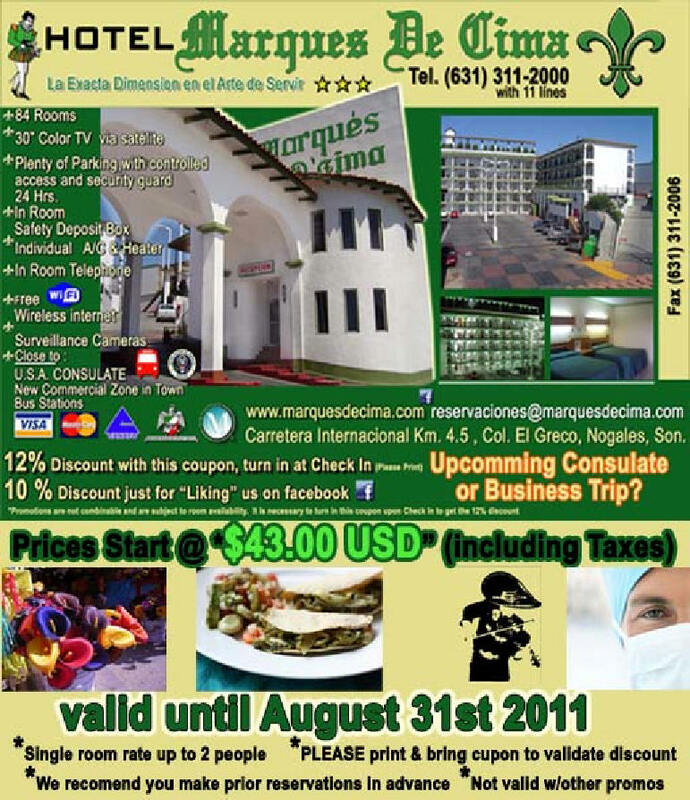 Unlike the USA and Canada, the nightly rates are very low, around $560 (pesos) for a single, $630 for a double, including taxes! That's around $48 to $54 per night in U.S. dollars! I never expected to find such a safe and clean hotel in Nogales in Mexico. Clean and spacious rooms, great service, efficient staff, great location, free WiFi with a good connection, 24 hour guard at the gate - I will recommend Hotel Marques de Cima for everyone.I spent a month at this hotel and it was a very good choice. I went to the US Consulate for business and the hotel was very close to it. I found the room was very clean and the staff was friendly. The price was excellent , love the free internet especially since I needed it for work. Definitely would return.